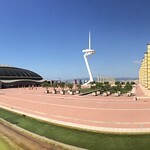 The Anella Olímpica (Catalan pronunciation: [əˈneʎə uˈɫimpikə], "Olympic Ring") is an Olympic Park located in the hill of Montjuïc, Barcelona, that was the main site for the 1992 Summer Olympics. The major facilities consist of the Olympic Stadium, or Estadi Olímpic Lluís Companys, the Palau Sant Jordi sports hall, the telecommunications tower designed by Santiago Calatrava, the National Physical Education Institute (INEFC) and the Picornell swimming pools. 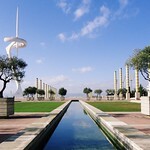 The Joan Antoni Samarach Olympic and Sports Museum is also located in the Olympic Ring. The main promenade is located uphill, midway to the militar castle. The complex includes the main baseball field opposite the swimming pools. Surrounding areas were grass covered, and green plastic obscured the view of the somewhat near cemetery. This last move showed some opposition, as can be viewed as unnatural. The original plan was designed around the main square, Plaça d'Europa and the olympic stadium. Rational and minimal, is linked to water through pools and a transversal canal. Communications tower echoed at first the tubular lamps dispersed in the "Anella" and (again) an ensemble of concrete and steel tubes, the elegant sculpture near Isozaki Arata´s Palau Sant Jordi. But then, the architect Calatrava lost a project in the city in the last minute and was commissioned weeks later to re-design the tower, now more futuristic, but maybe damaging the purity of the design.